Mountain biking is a fun and rewarding sport, but it requires having a decent course to ride. Finding a course that is both challenging and exciting can be difficult, as the best courses tend to be sorely overcrowded or poorly maintained. If you're serious about mountain biking and have the right amount of ambition, you can create a personal mountain bike course that is tailored to your personal s**** level and desires. Get permission to build your mountain bike course. Make sure the land you want to build on is not privately owned or protected, such as a state park. The best area to build on is land that you personally own. If you do not personally own the land, contact the landowner and present a written proposal that details where and how you would like to build the course. For a short course, you will need anywhere from of terrain. For a medium-length course, make sure you have at least of land. For a longer course, you will need or more of terrain. Try to form a partnership with the landowner or property manager so that all involved parties will benefit. Walk the general path where you want to make your mountain bike course. Scout out the land and make sure that it is neither too steep nor too flat. If you come across unexpected obstacles that are not easy to clear, such as large tree stumps or roots, plan to make your route go around the obstacles. The best mountain bike courses work with and blend into the natural features of the terrain. 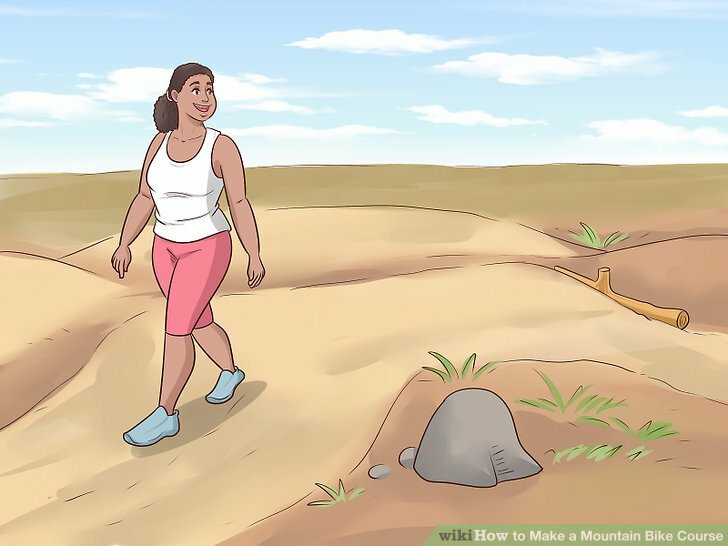 If you can't walk down the slope of the land without running or having to catch yourself, the land is likely too steep to build a sustainable course on. If the terrain is not sloped at all, it may not be challenging enough for more experienced riders. Use pin flags to mark the beginning and end points. 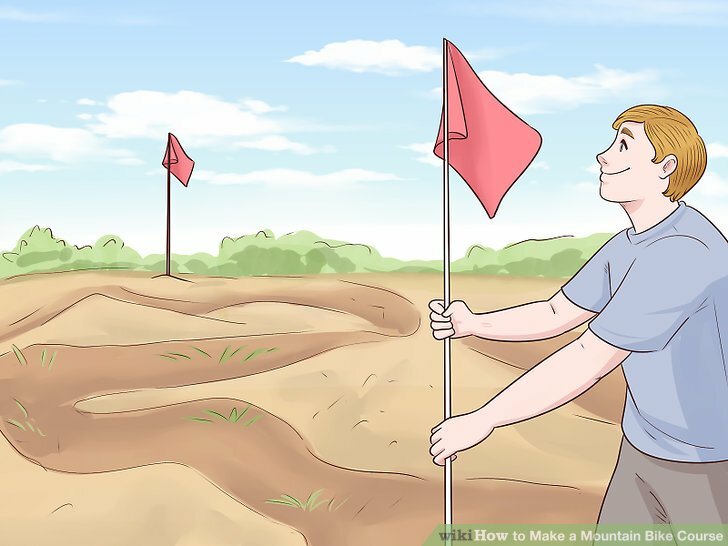 Once you've determined that the terrain is acceptable and there are no large obstacles in the way, go back and place a pin flag at the starting point and the end point of the course. Make sure to stay within the property lines. If you want your course to form a loop, the beginning and end points will be the same. Instead of flagging the same spot twice, mark the border on the outside edge of your course on all 4 sides. Pin flags are preferable, but you can use spray paint or any other marker that’s easy to see. 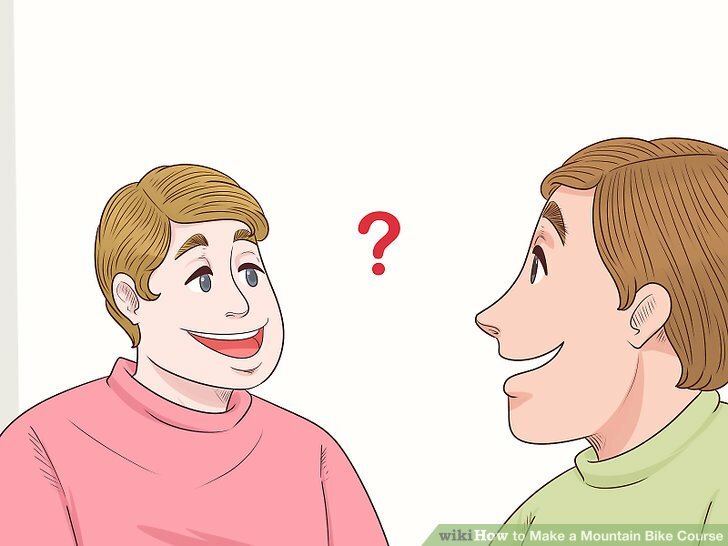 Go over the course and mark the main features. 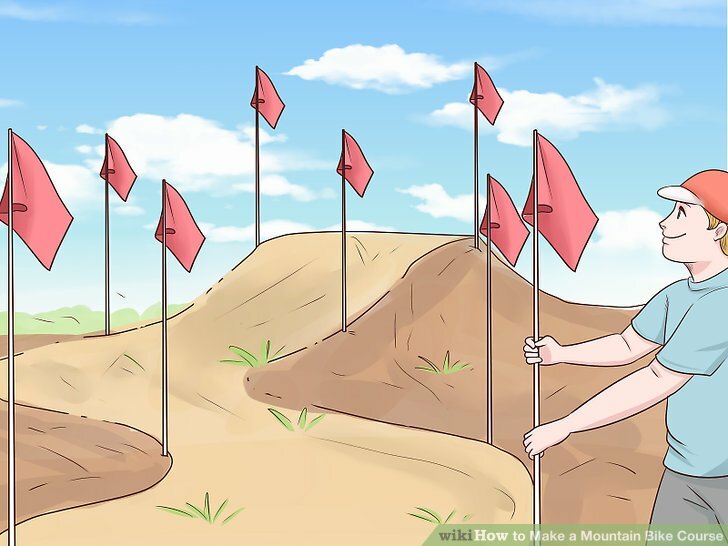 Place a flag or marker in any specific areas that you want to include in your course, such as natural drops, turns, or landmarks. These are called control points, and they influence where the trail will go. Positive control points are places you want the course to go, such rock outcroppings, jumps, or other natural obstacles you want to include. Negative control points are places you want the course to avoid, such as extremely steep slopes, certain water crossings, or other safety hazards. 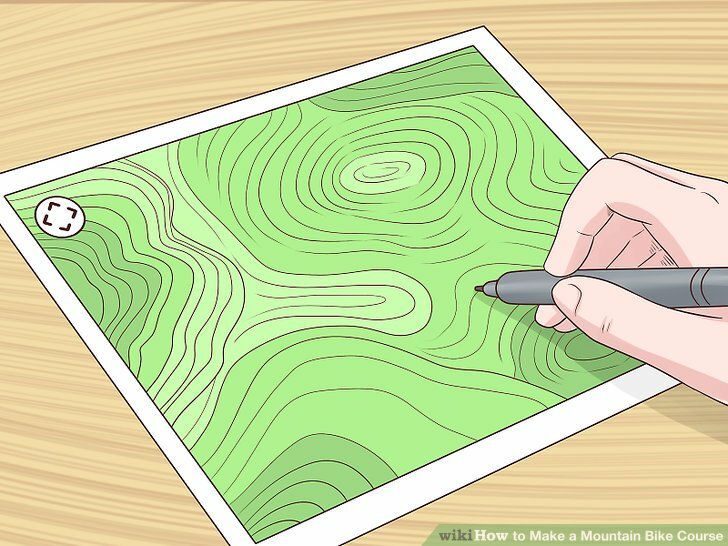 Draw the control points on a topographical map. Include the spots where you marked the beginning and end of your course. 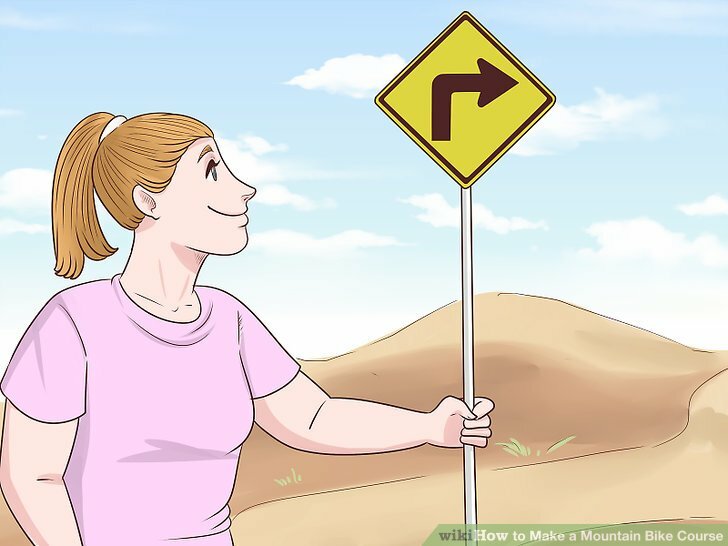 Use the control points to draw the basic route you want to course the take, connecting the points as you go. When you start planning the route of the course, consider the landscape and its natural features. Use these to your advantage to include slopes, turns, and jumps, as desired. Use a pencil so you can erase the marks if necessary. This is the initial planning for the trail route. Walk back over the path you drew and mark the general trail alignment. As you walk, use a pin flag to mark the route of the course. Place a pin marker on each side of the marked trail to keep the width consistent. Ensure that your trail hits all of the positive control points and avoids the negative ones. The average width of single-use mountain bike path , while a multi-use course is . If your course is multi-use, include several passing areas where bikers can go around each other if necessary. In these areas, widen the course to comfortably include 2 bikers riding side-by-side. Roughly wide is a good rule of thumb. 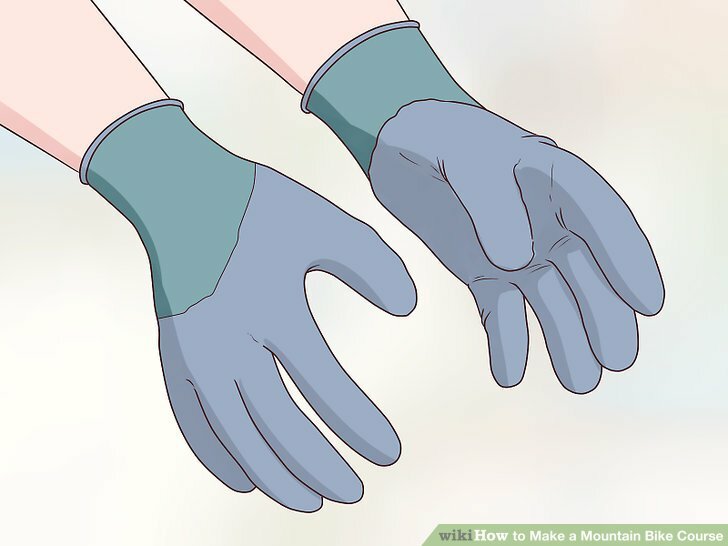 Wear good-quality work gloves to protect your hands. You will be doing a lot of digging, so wear work gloves to protect your hands from blisters and other injuries. They will also help you maintain a firm grip while you work. Clear shrubbery, rocks, branches, and other debris out of the path. Walk back over the area you just marked with pin flags and remove all sharp, pointed, or loose stones in the path. 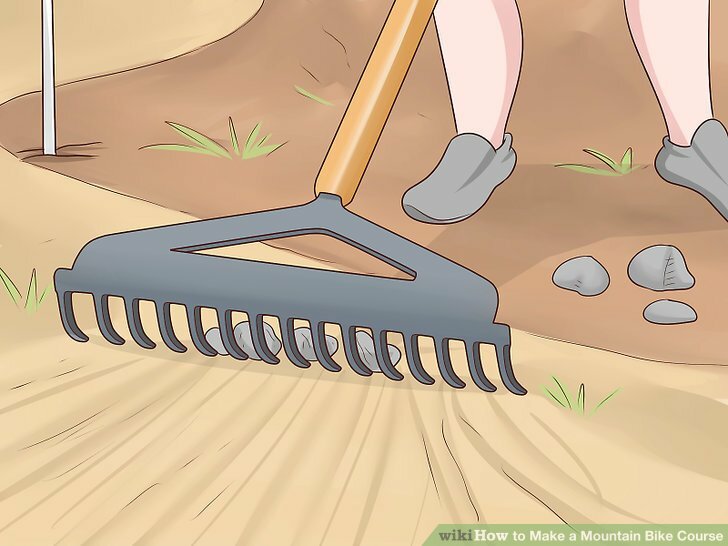 Use a rake to clear away small rocks, branches, or foliage. Either throw the collected debris outside of the boundary markers, or load it into a wheelbarrow to dump away from the path later on. Clearing debris ahead of time will make it easier to break up the ground later. 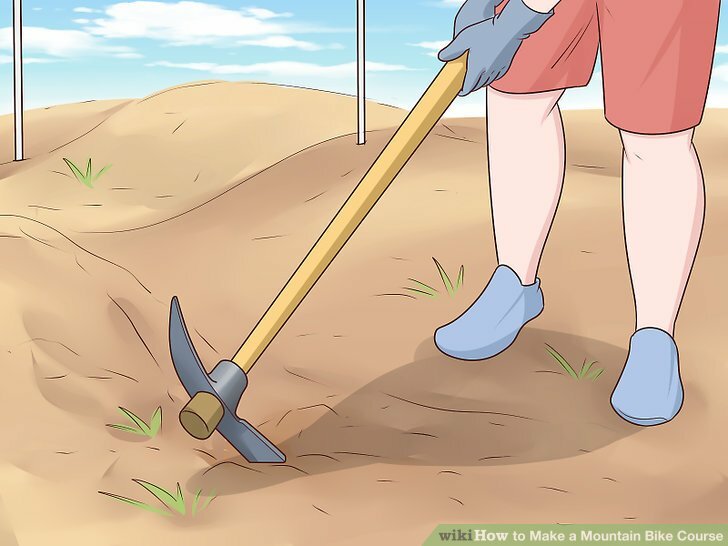 Use a rake or mattock to loosen the ground and dig the tread. Once you’ve cleared away any obstacles in the path, use a mattock to break up the ground between the pin flags in the path you marked. Rake away the top layer of grass until all you’re left with is the soil underneath. Do this for the entire length of your course. If the ground is already covered in dirt or soil, you'll still need to break up the top layer of ground so you can go back and pack it down. Clear away more ground for turns. Turning radii should be roughly wide. Compact the loosened tread with a rake or shovel. Go back over the ground you just loosened up and use a flathead shovel or a rake to pack it down. If the dirt is sandy or loose and it's difficult to pack down, use a garden hose or bucket of water to dampen the ground before you pack it. Make sure the ground is packed well so you can ride your bike on it without spinning out or causing major ruts. Packing the ground is one of the more labor-intensive, tedious aspects of building a mountain bike course, but it's also one of the most important. If the dirt is too loose when you ride the course on your mountain bike, your front wheel will slip. Hike or ride your bike carefully over the trail several times to compact the soil more easily. If your course is wide enough, driving a vehicle over the tread can pack it down quickly and efficiently. Include obstacles in your course to increase difficulty. 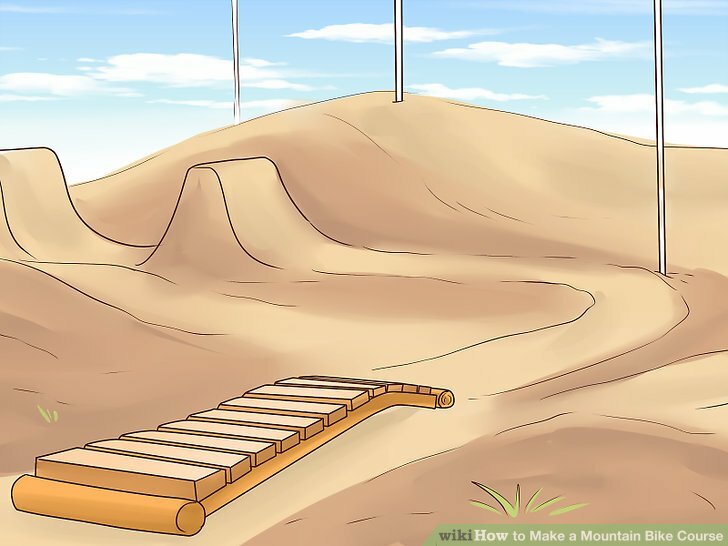 Use the excess ground you removed earlier to build dirt jumps along the course, or add in some wooden ramps. Use the built-in features of the terrain before adding artificial obstacles. Natural obstacles are generally best, and there are usually plenty of trees, large rocks, and bushes that you can wind around for more of a challenge. 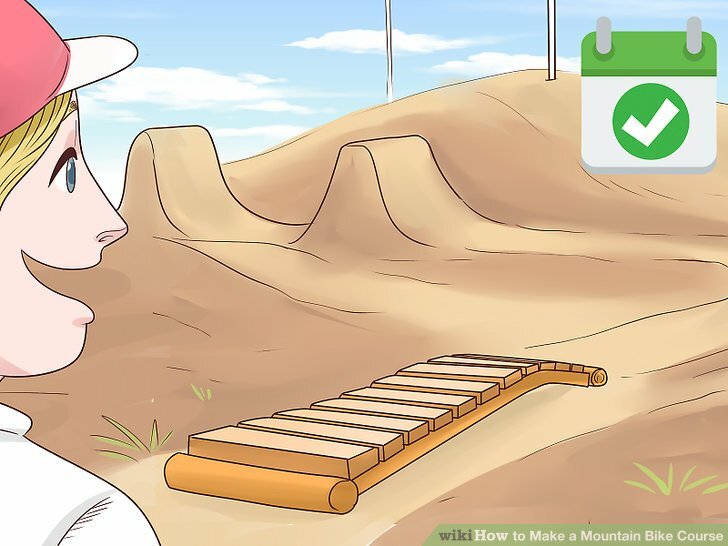 To build a dirt jump, use the ground you collected while digging the tread. Pile the dirt to the desired height, and use a hose to dampen the top layer of the dirt. 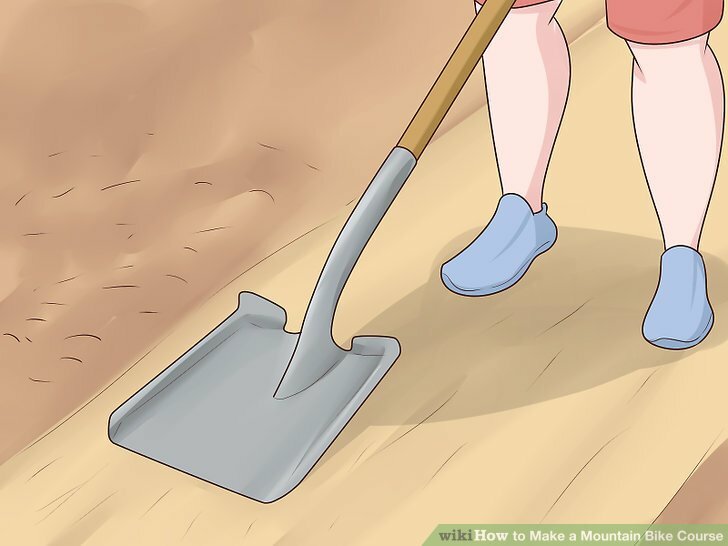 Use a flathead shovel or rake to pack the dirt down as tightly as possible so your front wheel doesn’t spin out on loose dirt. Keep jumps between off the ground, as any higher could be dangerous. Some other examples of common obstacles are boulders and logs that you can place in the path of your course. Maintain the course you built by checking it several times a year. Check for any fallen branches, and clear away layers of fallen leaves or weeds. If the ground has started to erode, take your shovel and pack it down again. Adding compacted soil or gravel to the course will keep it from eroding as quickly and lessen maintenance required to keep up the course. Don't ride your course while the ground is wet. This will keep the ground from eroding as quickly. Be creative, and don't be afraid to tweak your course as you ride it. Ask other bikers to ride your course and get their opinion on areas you can improve. Always wear a helmet when mountain biking. If other people will be using your trail, place signs to warn riders about upcoming hazards (e.g. ramps, drop offs, or bomb holes).